Dungeon Tour at Pontefract Castle01977 723 440work CastleFrom medieval times through to the English Civil War period, the 11th century cellars below Pontefract Castle were used as a prison and dungeon. 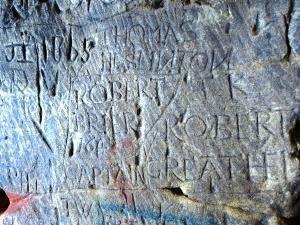 Visitors can visit the underground dungeon, cut out of solid rock, and see where Civil War prisoners carved their names into the cell walls. Children can pick up one of our entertaining dungeon activity sheets to accompany them on the tour. Tours are available Thursday, Saturday and Sunday at 1.15pm and last around 40 minutes. Additional tours will be available during school holiday periods and on event days. Tickets available from our new visitor centre shop. From medieval times through to the English Civil War period, the 11th century cellars below Pontefract Castle were used as a prison and dungeon. Please Note: There are steep steps and sensible footware is advised. Tours will be available from mid July and will run Thursday, Saturday and Sunday at 1.15pm and last around 40 minutes.